(Note) The sensing range is the value for the RF-230 reflector. In addition, the sensing range is the possible setting range for the reflector. 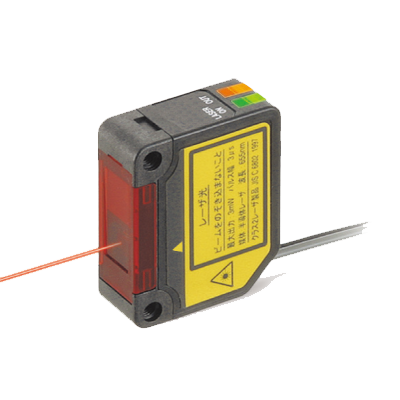 The sensor can detect an object less than 0.2 m 0.656 ft away. Note that if there are white papers or specular objects near the sensor head, reflected light from these objects may be received. In such cases, use the M.G.S. function of the amplifier unit to change the response time or incident light sensitivity. (Note) This product complies with 21 CFR 1040.10 and 1040.11 Laser Notice No. 50, dated July 26, 2001, issued by CDRH (Center for Devices and Radiological Health) under the FDA (Food and Drug Administration). For details, refer to the Laser Notice No. 50. (Note) Cable cannot be extended.